Spend Matters welcomes another guest post from Becky Partida, a supply chain management research specialist at APQC.  How much are we spending?  Are we getting what has been promised? Many organizations have taken advantage of the information that spend analysis can provide their supply chain operations. APQC’s Open Standards Benchmarking in procurement indicates 90 percent of responding organizations have initiated spend analysis programs. Organizations with spend analysis have reaped benefits in the areas of cost effectiveness and process efficiency, and their procurement performance provides insight into their potential for improved supplier relationships. As the figure below shows, the overall cost to procure materials and services is much lower for organizations with spend analysis programs. At the median, an organization with a spend analysis program and $5 billion in revenue would spend $16.5 million on procurement activities, whereas a similarly-sized organization without spend analysis might spend $18.5 on the same activities. This represents a potential savings of $2 million in procurement cost for organizations that analyze their spend. The lower cost among organizations with spend analysis programs could be related to leaner procurement functions resulting from these programs. Because spend analysis provides knowledge into an organization’s procurement activities and expenditures, it allows the organization to identify areas for cost reduction and process improvement. This, in turn, could result in a lower overall cost to procure goods and services. Organizations engaging in spend analysis also have more streamlined procurement functions. These organizations need fewer full-time equivalent (FTE) employees for their procurement processes per $1 billion in purchases than other organizations. At the median, those using spend analysis need 91 FTEs for the procurement process. Those without such programs need 129 FTEs for the same activities. This represents a 42 percent difference in the number of FTEs an organization needs to conduct its procurement activities. 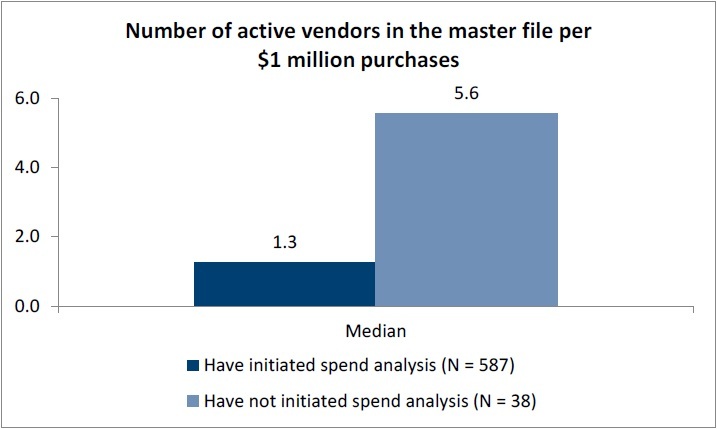 Organizations with spend analysis also have fewer vendors in their master files per $1 million in purchases (Figure 2). At the median, these organizations have 4.3 fewer vendors per $1 million in purchases than organizations without spend analysis programs. 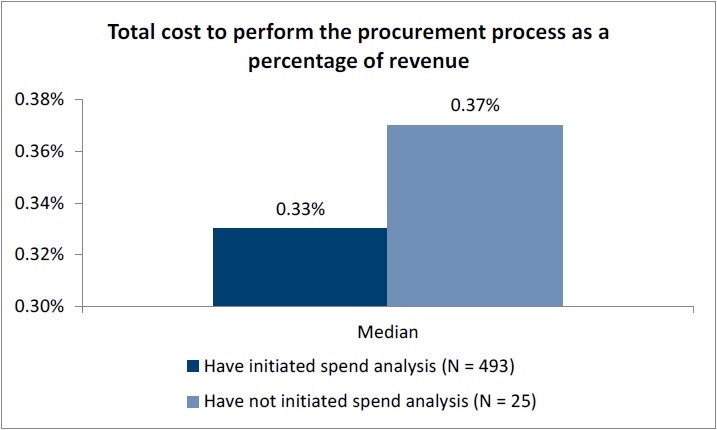 This difference in procurement function efficiency may provide insight into the relationships between organizations with spend analysis and their suppliers. The more streamlined procurement functions of organizations conducting spend analysis may have enabled deeper relationships with a smaller number of key suppliers and reduced the number of employees needed to source and purchase materials. APQC’s data indicates that organizations engaging in spend analysis also perform better on several other procurement measures: total cost of the procurement cycle per purchase order, procure to pay cycle time in days, and percentage of purchase orders approved electronically. 1 percent of their purchases from this type of supplier. The increased use of suppliers with vendor-managed inventory programs may be indicative of the enhanced supplier relationships enabled by spend analysis programs. Once an organization determines which suppliers offer the best value, it can work with them to establish more evolved procurement processes such as vendor-managed inventory programs. The starting point for superior procurement performance and supplier relationships is information. Spend analysis offers an organization knowledge on the amount of money it spends on purchasing materials and services, the suppliers with which it spends most, and whether the value provided by suppliers meets expectations. This information can then be used to modify procurement processes and supplier lists in order to maximize the money the organization spends on procurement. Once this is accomplished, the organization can adopt other mature practices such as supplier relationship management and supplier category management. This can provide organizations with greater mutual value from their suppliers and allow them to establish leaner, more efficient procurement functions. Really great benchmark information on the benefits of conducting spend analysis. I do question however the response that 90% of organizations really are doing spend analysis. I suppose if left undefined maybe people would just say yes but there is a huge range of what is actually done. That being said I would accept the measures of improve cost and efficiency from doing a spend analysis as even doing the minimum spend analysis as a project still always results in some level of savings.